Sorry about the length of time elapsed since the last post–work and play has come between myself and my postings! But here’s a quick update from a short hike through El Yunque National Forest in Puerto Rico. northern and eastern Puerto Rico. 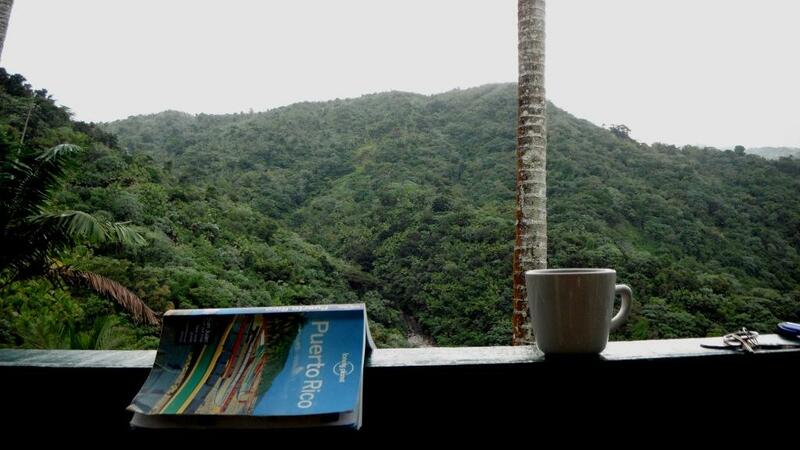 The rainforest itself runs from near sea level to the peaks of El Yunque and El Toro, at over 1,000m. This leads to several climactic zones, including the dwarf forest near the peaks–a section where the vegetation grows shorter and thicker with fewer leaves (it was more like a normal-sized forest to Hana!) As to be expected in a rainforest that receives over 200 inches of rain per year, numerous waterfalls run through the park, populated by coqui frogs (the ubiquitous Puerto Rico-only frog! ), numerous birds and a few lizards. Absent are the hordes of insects found in other jungles, perhaps thanks to the tradewinds that buffet the park and bring the massive rainfall; at least, Hana and I never felt that we were being eaten alive, as is the case in other jungles! El Yunque is also massively popular with locals and tourists, and its proximity to San Juan means a weekend there can involve a longer search for parking than actual hiking! We were lucky enough to snag a spot that just fit our tiny rental car on one of the many twists and turns that make up the El Yunque road, but woe be it to the 4×4 lumbering up the mountain road. Having stayed earlier in our trip on the southern side of El Yunque, where we enjoyed a private jungle waterfall pool to ourselves, it was a little disrupting to encounter the hordes of (sadly) overweight visitors huffing and puffing around the easier trails and cookhouses. 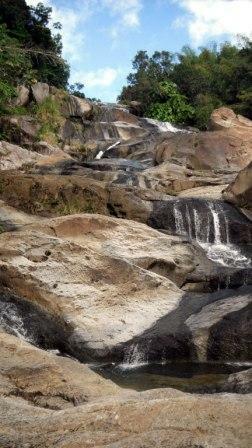 For this reason, we chose one of the more difficult trails in the park–the El Yunque Trail. 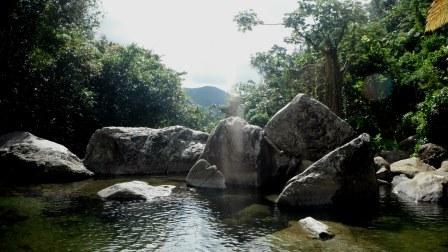 It is about a 5 mile round-trip excursion, and can be combined with some other trails that dead-end into the Yunque Trail. The Trail climbs about 1,500 feet, passing little trickles of water (that can become BIG trickles on a rainy day! ), beautiful jungle, a wonderful rock ride at the edge of the world, and ends at a stone observation tower that provides an epic view to the north of the Caribbean. Once on the trail, we quickly rose, climbing away from the masses of crying children and shuffling parents below. The jungle obscured the long views of the mountain, but looking into its verdant emerald depths was scenery enough. Though coquis normally chirrup in the evening, here in the rainforest they accompanied us with a constant chorus as we climbed. Initially the trail was paved (! ), but this soon broke into a simple rock path–the vegetation and constant water running down the path would likely make quick work of any ‘permanent’ concrete. Every so often, we would cross over a rock streambed that shot away near vertical from us. The jungle grew no less dense as we climbed, but the trail would sometimes break from the trees and palms, and the whole green-carpeted valleys of the rainforest were ours for the viewing. Near the top, El Yunque is almost constantly covered by clouds, and the effect is surreal when contrasted against the jungle. The world looked half finished beyond the trees as we rose into the clouds. Beyond the leaves and fronds and roots, a simple grayness blocked out the world. It was at once both unnerving and serene. We took a quick side-trail that emerged onto a rocky sub-summit, the valley falling away below us. Against the rocks, we could see the cloud whipping by, but there was no sense of motion in the general gray until–like an opening of eyes–the cloud passed, and the entire rainforest emerged below us, running down to coast and blue seas beyond. It was breathtaking, and sublimely quiet. A few other hikers were perched among the rocks, snapping photos of forming weather made visible. We stayed a bit, enjoying the breaks in the clouds, and the ethereal grayness that rushed back in to fill those gaps, then preceded to the actual summit. Not much further, the summit lay up a road to an observation tower made a stone to look like an actual Spanish tower, replete with battlements. It was a fine place, but too many of the shuffling families had taken the shorter road “trail” and disturbed the peace. We stayed for a moment, regretting the breaking of my camera in a snorkeling incident earlier, but then retreated back into the jungle. The contrast between the two summits was glaring–the peaceful, quiet stone on the edge of the world, and the raucous actual summit. It just reinforces the idea that the end goal is not deserving in of itself, rather the journey. A summit is nothing but a summit, but that simple island-in-the-sky just a few hundred feet below conjured the real excitement of adventure and the unknown–something still in the midst of creation versus a solid stone structure. However, stone is not always so out of place, as we took a quick spur of the descent that led us to a steep series of stone stairs. The stairs rose up from the trail to an unseen platform at another minor summit. While hiking up these stairs, it was easy to conjure images of conquistadors and natives and all manner of ancient rites. We came to another platform in the clouds, and the tradewinds brushed cool and wet across our faces. Even in the midst of the overcrowded forest, we found solitude. 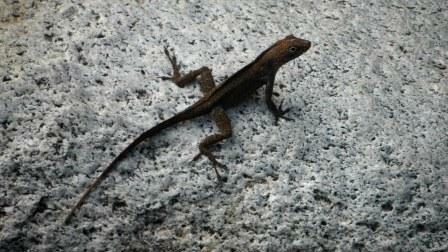 We quickly descended in fading light while the choir of coqui chirrups gained voices. By this time, the forest was mostly empty, the tourists and sanjuaneros returned to the city. Stopped at a red light in El Portal, we watched a boriquena sinuously dance salsa with an old man who moved with marionette jerks. All in all, a good day.